Fleas are pesky and annoying and hard to get rid of. After you have treated you pet with medications and shampoos and have treated your house with appropriate pesticides, you want to know that all the pests are gone.To truly know if you are rid of all the fleas, you have to properly check your pet. Place your pet on the white paper or towel. Make sure that the paper or towel is a bright white so that it is easy to see any black fleas that fall off. Using the flea comb, brush against the pet’s hair so that you can see your pet’s skin. Start with the back and work your way down. Make sure you check your pet’s toes, around the ears, armpits, tail and head as well. These are often popular places for the fleas to hide and hang out. Keep a close eye on the white paper or towel. You are looking for and fleas that fall or jump off. Once you see one, it is safe to assume there are more. Apply petroleum jelly to the flea comb and brush your dog a second time. If your dog has fleas, they will get stuck to the jelly and you will be able to see them. This is also a good way to treat your dog for fleas because the jelly picks them up while you brush. Check for flea dirt. 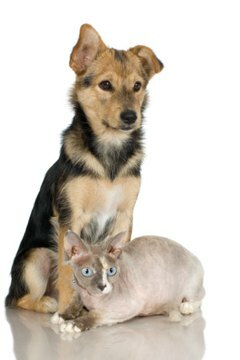 If your pet has fleas, you will find little black or brown specks called flea dirt. Flea dirt is pieces of blood left behind by fleas on pets. These specks may also fall off onto the paper. Start treatment again if you find a flea. Just one flea can create another infestation, making it important to restart and continue treatment if you find one. If you have not already done so, seeing a veterinarian may be the next step if you have already tried unsuccessfully to treat the fleas more than once. A veterinarian can offer stronger products than over-the-counter medications and also offer some helpful advice to help get rid of all the fleas. PAWS: Fleas, Ticks, Mosquitoes – Prevention and Treatment.